1. Make sure the booster battery is 12-volt and that its negative terminal is grounded. 4. Turn off all unnecessary electrical loads. 5. Connect the jumper cables in the exact sequence shown in the previous illustration. First connect one end of a jumper cable to the positive terminal of the discharged battery, then connect the other end to the positive terminal on the booster battery. 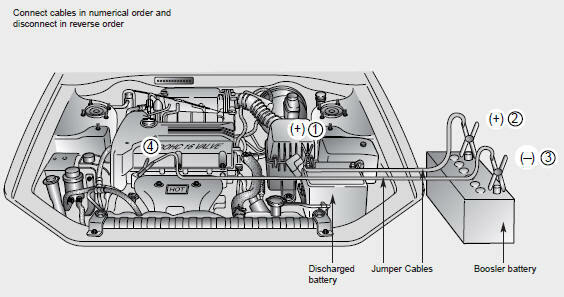 Proceed to connect one end of the other jumper cable to the negative terminal of the booster battery, then the other end to a solid, stationary, metallic point (for example, the engine lifting bracket) away from the battery. Do not connect it to or near any part that moves when the engine is cranked. Do not connect the jumper cable from the negative terminal of the booster battery to the negative terminal of the discharged battery. Do not allow the jumper cables to contact anything except the correct battery terminals or the correct ground. Do not lean over the battery when making connections. If the cause of your battery discharge is not apparent, you should have your vehicle checked by an authorized Kia dealer.